Today being Good Friday I took a day off from my work. Yesterday I had to set my vacation accordingly so people were notified about my absence, the subject which I wrote was “OOO due to Good Friday”, reading this few of my friends came to me and asked, should we give our condolences as Jesus was crucified or wish Happy Good Friday? We are confused. I gave a smile and said, we don’t spend Good Friday as a day of mourning, instead we rejoice and thank GOD that he sent his one and only son to redeem us from our sins instead of destroying us. Jesus was the ultimate sacrifice and there is eternal life only through him. Though it’s not common to say Happy Good Friday, I told them you could wish me Good Friday, because 2000 years back there was a day when my Jesus defeated death and gave us eternal life. Word of Forgiveness Luke 23:34 Jesus said, “Father, forgive them, for they do not know what they are doing.”And they divided up his clothes by casting lots.The Pharisees, soldiers and most of the people were mocking Jesus. They were ignorant of the fact that he was carrying the burden of their sins. But even when Jesus was bearing the pain and the baggage of sins of every human being, he still spoke the word of forgiveness for them. His own people disowned him and yet he chose to forgive them. All he had to do was cry out to the angels and they would come to his rescue but he chose our redemption and forgiveness over his pain. Word of Hope Luke 23:43 Jesus answered him, “Truly I tell you, today you will be with me in paradise.” This is the sentence that Jesus spoke to one of the thieves who was crucified with him. While one of the thieves ridiculed Jesus, the other one repented on the cross and what a privilege he got when Jesus said that he will be with Jesus in paradise. He spoke the word of Hope to the thief. We have this hope that through the resurrection of Jesus that we will meet him in the heaven. Word of Comfort John 19:26 When Jesus saw his mother there, and the disciple whom he loved standing nearby, he said to her, “Woman, here is your son,” Jesus ensured that his mother was taken care of. He knew that his ministry on this earth was over but before leaving he took care of everything and comforted his mother by letting her know that she would be taken care of even when she was not alive. Word of Understanding between Father and Son Mathew 27:46 And about the ninth hour Jesus cried with a loud voice, saying, Eli, Eli, lama sabachthani? that is to say, My God, my God, why hast thou forsaken me? The burden of sin was on Jesus when GOD turned his face away from Jesus. It was definitely a tough time for Jesus to endure all this pain. Here he cried out to his Father. Word of humanness John 19:28 Later, knowing that everything had now been finished, and so that Scripture would be fulfilled, Jesus said, “I am thirsty.” Jesus was 100% God and 100% human, this is also one of the verse which proved the human side of Jesus. I had happened to read an article which explained what Jesus went through during that last three hours before his death. Word of Completeness John 19:13 When he had received the drink, Jesus said, “It is finished.” Jesus did everything according to the will of his father and now he knew that the ordeal was over and the prophesy was completed so when he said It is finished it was a word of completeness. Word of Victory/Triumph Luke 23:46 Jesus called out with a loud voice, “Father, into your hands I commit my spirit.” It was Victory over Darkness when Jesus breathed his last and hence it was a victorious and triumphal moment. 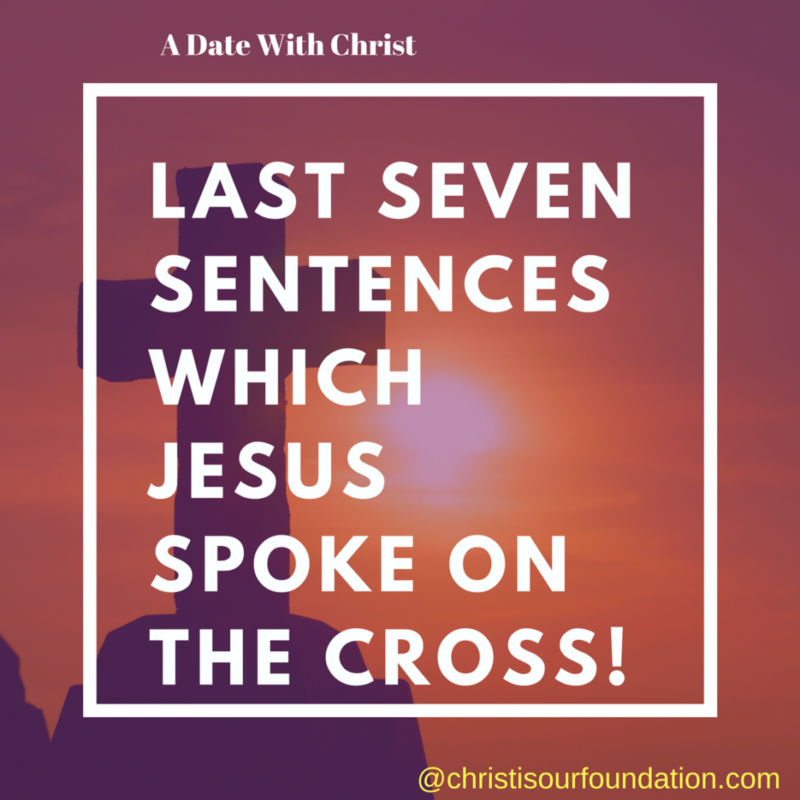 This article was posted under the section A Date with Christ in the category Episodes.